Outperforming monitor speakers twice the price, they are a worthy investment for the serious producer or mixing/mastering engineer. Enormous bottom-end acts like a microscope for low frequencies. Revealing, trustworthy frequency response across the spectrum. Razor-sharp stereo image for assessing stereo width/panning. Great all-rounder - clinical, but not to the point of overanalytical. Expensive - but not when you consider the competition at this price point! As a newcomer to the studio monitor marketplace, the Berlin-based HEDD Audio - set up by ex-Adam Audio MD Klaus Heinz and his son Dr Frederik Knop - is quickly gathering a buzz. Its range spans several sizes and configurations: the Type 05, Type 07, Type 20 (on review here), Type 30 and the forthcoming Tower Mains. Before receiving the review pair, we were sceptical - we’ve found Adam monitors a tad bright and analytical for our taste, and so expected a similar sound from the founder’s new brand. 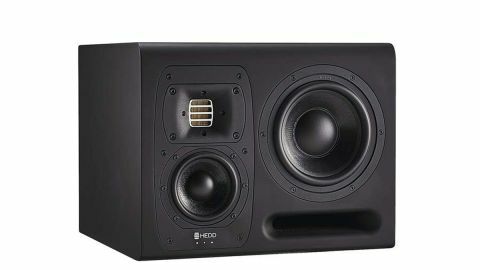 However, being in the market for new monitors, and with several UK electronic producers gushing with HEDD praise on social media, we were intrigued by the Type 20’s spec sheet. Upon delivery, their 15kg weight each and deluxe matte-rubber finish set them apart from more ‘plastic-y’ competitors. At the rear are balanced XLR and unbalanced RCA inputs, plus a slot for HEDD’s Bridge system, whereby an optional card can be fitted for Dante/AES67 inputs. Also on the back are high-shelf (+/- 4dB at 2kHz) and low-shelf (+/- 4dB at 200Hz) controls to help tailor the sound to your room. We installed the HEDD Lineariser - a VST/AU plugin designed to calibrate the monitors’ linear phase response - and loaded it up last on my DAW’s master chain. The Type 20s have a sleek, futuristic, somewhat dinky look - but their ‘cute’ size is in no way indicative of their sound! With a frequency response of 32Hz to 50kHz, their front-ported three-way design (7.2” woofer, 4” midrange driver and 1” ‘Air Motion Transformer’ tweeter) kicks out a scrumptious full-range presentation that completely blew us away. The first thing that hit us was their low-frequency response, presenting not only bass weight but also detail down there that we’ve only heard from the likes of sealed-cabinet designs from Barefoot and ATC. However, it’s not all about the bass... and the Type 20s are honest throughout the entire frequency spectrum. Brilliant productions sound as brilliant as they should, but flaws also became obvious. When mixing, we found midrange balance was child’s play, while treble is oh-so detailed without harshness. And the stereo image is incredible: mono elements are really mono, and stereo positioning is accurate down to minute pan moves, making width evaluation and adjustment a breeze. When evaluating monitors, we judge them on how analytical and ‘sterile’ they sound compared to how enjoyable they are to produce on - our holy grail is something bang in the middle. And that’s where we think the Type 20 sit. Need a speaker that’s vibey enough to give you a ‘big picture’ overview? No problem! But the Type 20s would be just as at home in a mastering studio, as you can listen deep into a mix and get as detailed as you like. Monitor speakers of this calibre aren’t cheap, but a good pair is essential if you’re serious about production, mixing or mastering. After only an hour of testing them in our studio, we’d already reached for our credit card. They absolutely deliver on all counts, and we recommend you hear them for yourself.